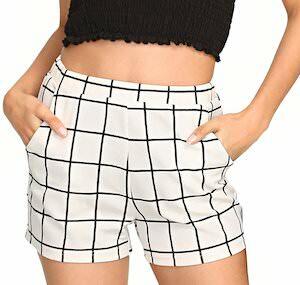 If you want some classy shorts then check out these white shorts with squares. The white women’s shorts are just perfect for summer and they are classy and that makes them perfect for a more formal summer party. On the white fabric you will find black lines that make perfect nice squares and that is nice especially if your like lines. The white shorts have pockets and comes in women’s sizes Small – Large for that perfect fit you like for your summer trips.